For the first time since the end of the semester, players hit the ice in Stingers jerseys at the Ed Meagher Arena. Apart from two of them, none of these skaters were Stingers though. Just under 20 of these young players were looking to earn spots at the Stingers main training camp in August. The team’s prospect camp is chance for players to try out to compete for a roster spot at the end of the Summer. While it may be a long shot for these players to make the team in September, it’s certainly not impossible. Realizing this only takes looking back to this time last year when Brandon Kosik worked his way up from prospects camp to make the Stingers roster and eventually earn himself a role and playing time with the team. The coaching staff certainly believed there were some good options for invites to training camp. “There’s a good crop of kids who are gonna make us work […] we’ll have some good decisions to make,” said assistant coach Kiefer Orsini on the first day of camp. It was Orsini who ran most of the action during the first day of camp, as head coach Marc-André Élement and head scout Justin Shemie watched and evaluated the players on the ice. It was a more relaxed and casual environment as Orsini ran drills and tried to put the players at ease to see what they could do after giving them a tour of Concordia’s Loyola campus and answering their questions. “It was a good morning. Kids are interested to learn about the program. Lots of questions asked,” explained Orsini. The assistant coach ran his players through some standard drills and off-ice agility work to get an idea of what kind of athletes they were without getting into specific testing when it came to things like bench press, chin ups and cardio testing. Orsini said that to evaluate players at all different stages of their offseason training wouldn’t be fair or give an accurate image of the player they are. The real evaluation began during an hour-and-a-half three-on-three game in the late afternoon. An exciting and exhausting brand of hockey let the players start to show off their skill while pushing them in terms of their endurance. Coleton Cianci, a standout forward in the first day of camp, was sweating heavily after the game but said that despite the exhaustion, he was excited to be back on the ice. “It’s been a little while since we’ve been on, it felt good to get back at it,” said Cianci who had been excited to show off his skill in the game and certainly succeeded with some offensive flare. 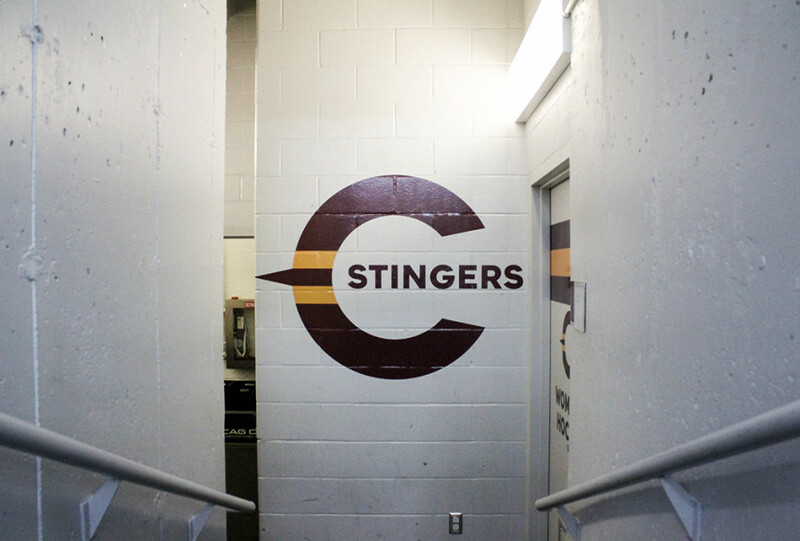 Two other notable standouts were new Stingers forwards Zach Zorn and William Leclerc. The coaches were impressed with the play of their new recruits as they stood out as difference makers at nearly every opportunity. The second day of camp was far shorter but more impactful and high intensity. Morning drills were run by Élement and followed by an hour long, five-on-five game. The level of competition grew with this and it became apparent that this would be where players would really make a case for an invite to training camp. It was an energetic game from the first drop of the puck. It quickly lost the feeling of a friendly scrimmage. Many of the players present were competing for spots as hard checking defensive players and it certainly showed. Plenty of gritty play, some shows of offensive force and, as forward Isaac Tkachuck put it, “a lot of bodies being thrown” later, the game finished eight to two. Tkachuk and plenty of others left with smiles, feeling that they had improved their standing in the coaching staff’s eyes in the five-on-five game. “It was a great experience. There was a lot of good players here so I felt like it was a really high pace,” said Tkachuk. At the end of the day, the coach echoed the players’ statements about the second match. “It was way more intense than the three-on-three. It was fun It’s always a great opportunity for guys to show themselves,” said Élement who would go on to meet with his coaching staff to make decisions on camp invites. Those invited to camp will hit the ice again in late August to battle for a spot on the 2018-2019 roster.